PDF is an extremely convenient media files' container that keeps the documents in order regardless of a files viewer you open your files with. This is the reason why this format is so popular when it comes to ebooks. Indeed, reading books in PDF means none of the images, text, graphics and other elements get distorted. However, you can forget about opening PDFs if you don’t have a special PDF reader preinstalled. 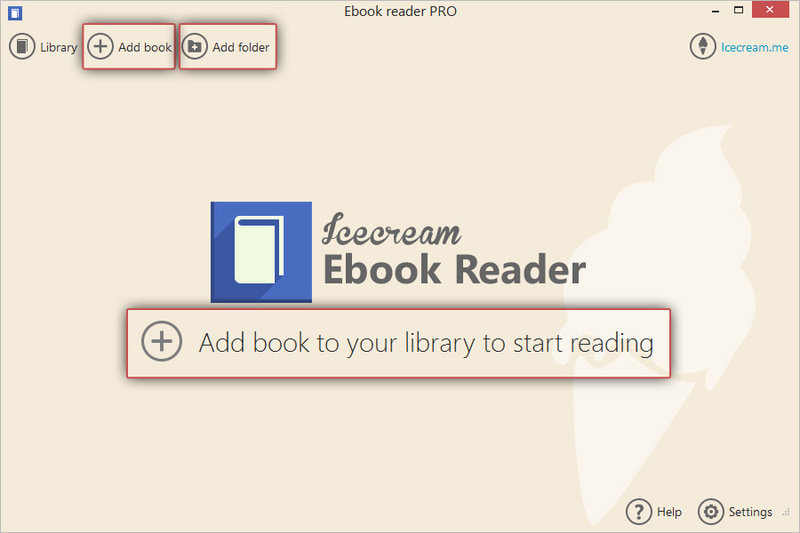 Icecream Ebook Reader is a smart program for reading and organizing ebooks in different formats, including PDF. This article will show you how to open PDF files on your computer. First of all, you need to download the application. All you need to do is click the “Download” button, save the installation file, run it and install the program according to Wizard’s guidelines. On the completion, open the program to start working. 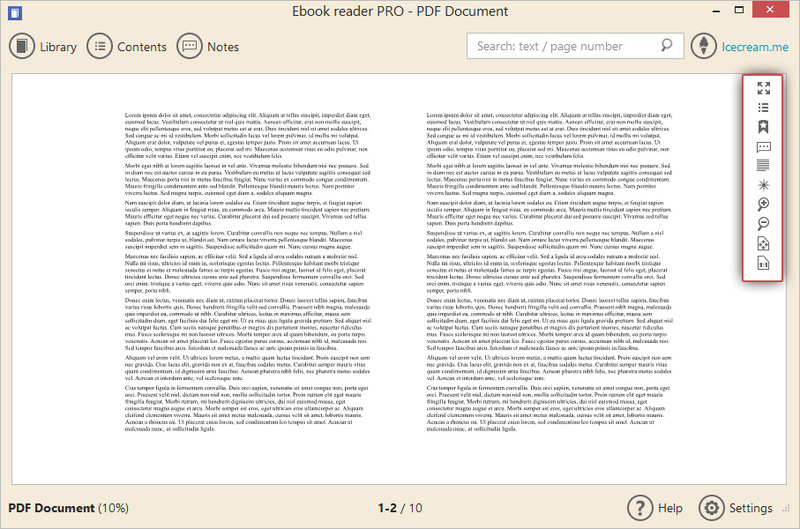 To open PDF files with Icecream Ebook Reader, you need to add them to the Library. To do that, hit the “Add book to your library to start reading” button in the middle of the main window or on the “Add book” button in the upper left side corner. Windows Explorer will help you find the book on your hard drive, and once that’s done, go ahead and pres “Open” to add files to the program. If you wish to add a folder with multiple PDF files, press the “Add folder” button. 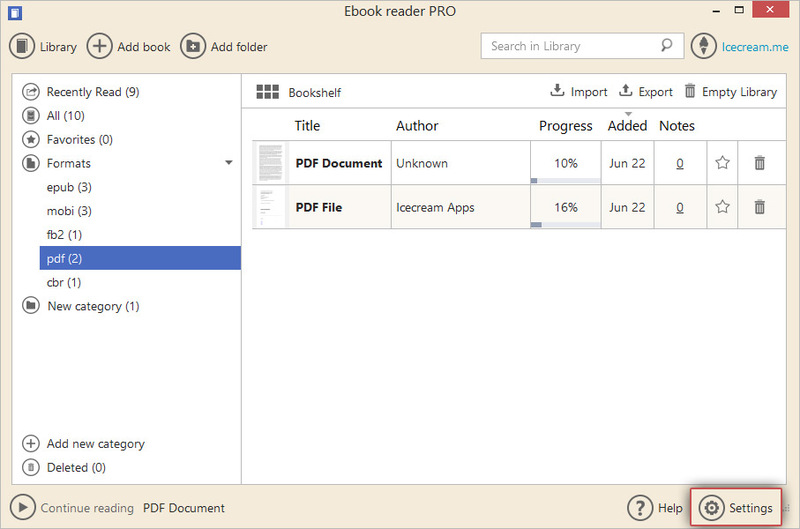 This PDF reader perfectly supports drag & drop mechanism, so you can drag both PDF files or folders with them into the program's window. To access the already added books, go to the program's Library (“Library” button in the upper left side corner). You can work in 2 library modes: Table view (which shows the information about the title, author, progress, date of addition to the Library, number of the notes added to a book and the options to add a book to Favorites and delete a book from the Library) and Bookshelf. To switch from one mode to another, click the icon in the upper left corner of a working area. The Library menu can be found in the left side of the program's window. To quickly find a book, use filters on the left side: “All”, “Recently read”, “Favorites”, and “Formats”. 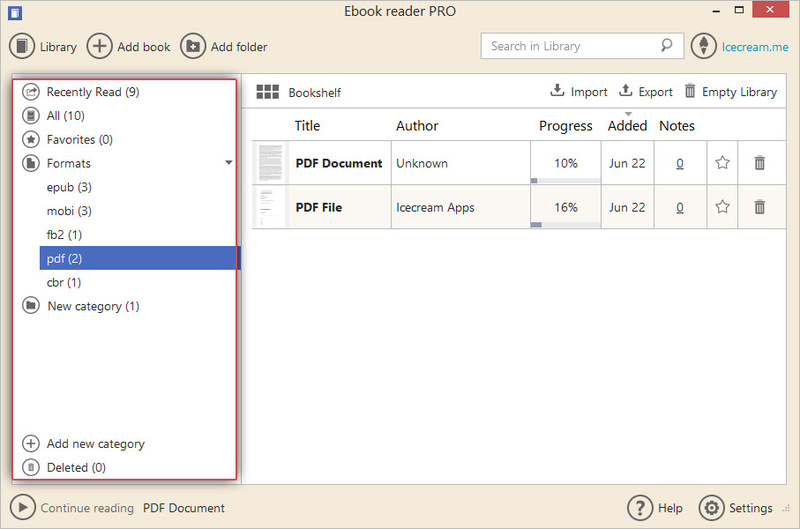 You can open the list of all the formats supported by Icecream Ebook Reader and select “pdf” option to let the program only show the added ebooks of PDF format. Below the formats' list there's a “Add new category” button. This button will create a custom categories for your Library for convenient books storing. The categories can be renamed and deleted if needed. The “Deleted” section of the Library contains the books that we previously removed from the Library. Such books can be either permanently deleted or restored back to the Library. Once everything is set up, go ahead and open PDF files. To do that, go to the Library of this ebook reader and double click a book’s thumbnail if in Bookshelf mode or a book's title if in the Table view mode. You can turn the pages by pressing the direction keys or “Page Up/Page Down” keys. Besides, you can click the “Table of contents” icon in the upper left side corner, select the page, and press the “Go to” button. The navigation scrollbar at the bottom of the opened PDF file will help you scroll through the pages of the file: move the marker to the right and to the left for that. The toolbar on the right side features a number of additional menu options that let you to: switch between full screen and window mode (F11 key has the same functionality), show the opened file's table of contents and list of bookmarks, add a new bookmark, show the notes panel, switch the pages' layout between single and double paged, change the reading profile (Day, Night and Sepia) , zoom in and zoom out to scale the image: you can scale it to fit the screen or go back to normal 1:1 scale. Check the bottom of the page to see your reading progress in percents. Press the “Settings” button in the bottom right corner. This action will open the Settings panel of the ebook reader. Over here you can change the values for various settings of the program to read PDF files in the most convenient way. The full guide for the options offered in the Settings panel is described in this guide here: How to Change Icecream Ebook Reader Settings.